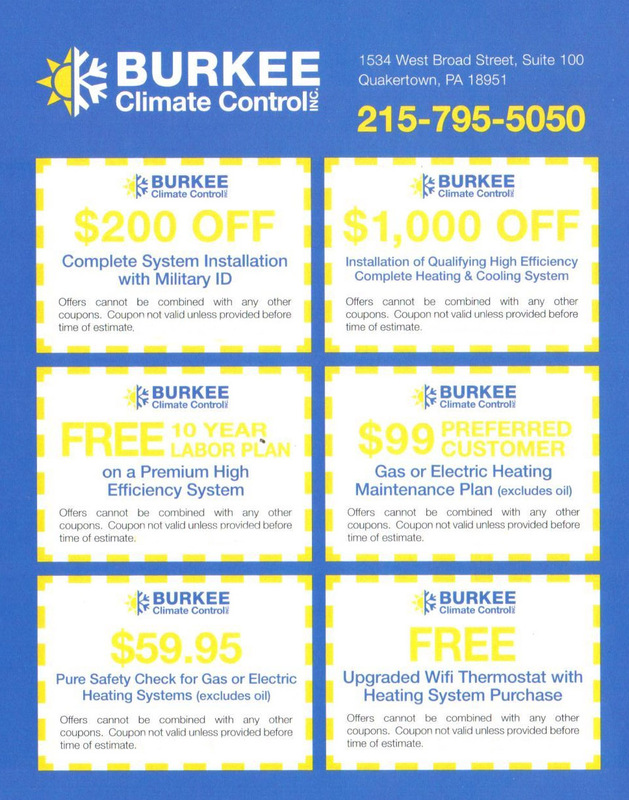 Specials - Burkee Climate Control, Inc.
$200 Off Complete System Installation with Military ID – As a thank you to those who have served in our Nation’s Military, we are providing all former and current service members a discount on your next installation. All you have to do is present your Military ID and the coupon below to a tech at the time of your estimate. $1000 Off Installation of Qualifying High Efficiency Complete Heating & Cooling System – Need a new heating and cooling system? Looking to reduce your monthly utility bill? We can help! With a High Efficiency Complete Heating & Cooling System, you can get better indoor air quality, moisture control, and more comfort, all while getting a quieter HVAC system that is more environmentally friendly. For a limited time, you can get $1000 off your quote by presenting the coupon below to your tech. Free 10 Year Labor Plan on a Premium High Efficiency System – As fellow homeowners, we understand the need for reliable service on your heating and air conditioning systems. That’s why we’re offering free 10 year labor plans for qualifying premium high efficiency systems. $99 Preferred Customer Gas or Electric Heating Maintenance Plan (excludes oil) – Maintenance for the heating is usually one of the last things homeowners think of until it is too late. That’s why we’re offering a preferred customer maintenance plan for gas or electric heating systems for just $99. A steal! $59.95 Pure Safety Check for Gas or Electric Heating Systems (excludes oil) – You should have piece of mind that your heating system is operating without hazard. For $59.95, our techs will come out and make sure that that is the case. Free Upgraded Wifi Thermostat with Heating System Purchase – In the age of the internet, everything is connected, including your home’s heating system. Upon presentation of this coupon, we will upgrade your thermostat to a Wifi Thermostat so that you can manage your home’s temperature from anywhere inside. Utility rebates may be available for qualifying systems. Contact us or your utility provide today for more details on the added savings!